Now, I’m not going to lie – caramelising the onions was not as easy as I thought it would be. The first time they looked more charred than caramelised – and it took me three attemps, three different methods (and a whole lot of onions) to get the right, rusty colour. The first recipe involved olive oil, butter, a fair bit of sugar and no stirring whatsoever. A recipe for disaster. The second one, with olive oil and no sugar, didn’t turn out as horrible – but the onions were still way too dark and almost bitter. Can I blame it on the pan? In a large, heavy-bottomed skillet melt the butter over low heat. When it foams add onions, brown sugar, a little salt and pepper. Cook for 20 minutes, stirring occasionally. In a small saucepan set over medium heat, combine sugar and 1/3 cup water. Stir until the sugar completely dissolves, then add cranberries and cook for 3 minutes, before draining them and setting them aside. Preheat your oven to 180°C. Place the puff pastry on a baking sheet, and with a small pairing knife, score a 1/4 inch boarder along the inside of each rectangle. 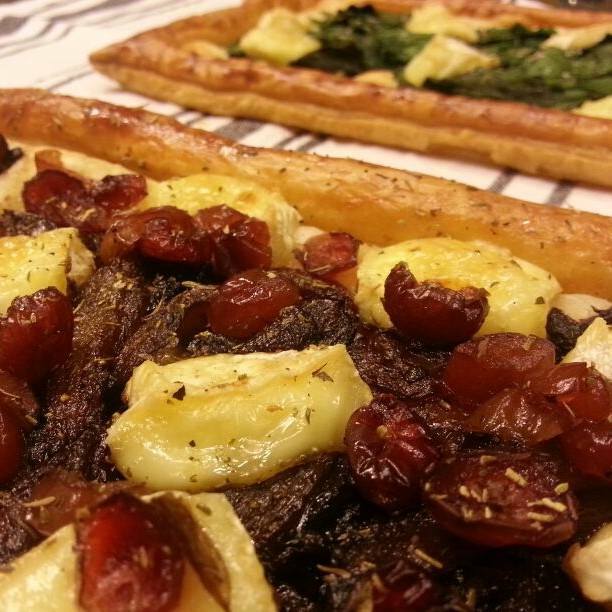 Scatter the caramelized onions evenly on the puff pastry, then sprinkle your herbs of choice. Nestle the cheese among the onions, then scatter the cranberries. Brush the edges with the egg white and bake for 15-20 minutes, until golden brown. Next Post A word about… living in the middle of nowhere.